It's a Party Palooza! And a SALE! Is this not her CUTEST KIT YET??? 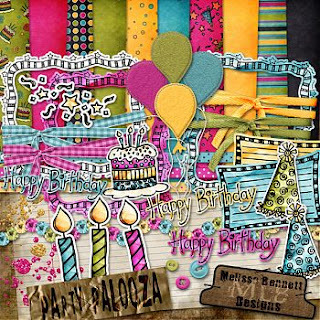 I had to snag this newest kit, Party Palooza, from Melissa Bennett's store at Scrapbook-Bytes. I am slowly acquiring *all* of her cute cute kits, lol. AND. Through today, 2/29/08, she is having a 50% off sale, so you can snag TWICE as much! I had a few things from her on my Kaboodle list, so I grabbed a few things at half off. 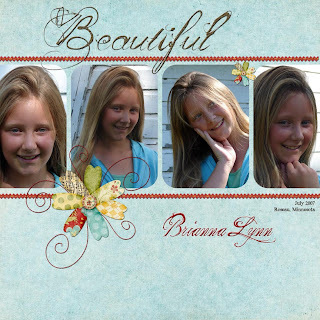 AND...Scrapbook-Bytes has a FREEBIE. This is the MOTHERLOAD PEOPLE! 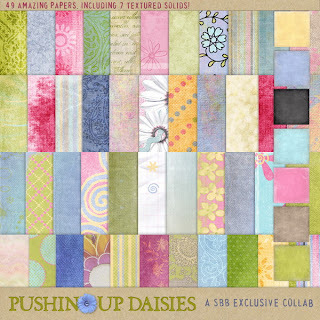 A huge mega collab kit, Pushing Up Daisies, that you can get for FREE with a $10 purchase through 3/2/08. LOOK at all the papers and elements! 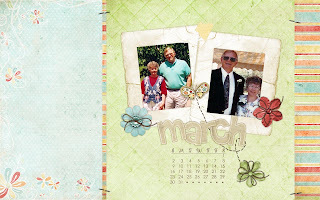 The March desktop freebie is up at the Shabby Princess blog! Is this not the cutest one yet??? SO springy and fab! All the papers and elements used are from a new freebie kit that will be up soon...I for one will be stalking her blog to get it, lol! Here's my completed desktop...easy peasy! Vintage scanned pics are of Mom and Dad way back before anyone had a digital camera. 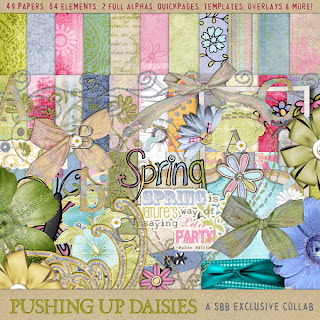 The Girl Talk Blog has a cute one using the DARLING Love Sprung kit at Sweet Shoppe Designs. 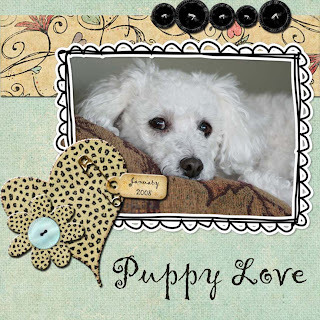 And Shabby Miss Jenn has another cute one designed by Sarah Vrolyk. Which one will you pick? They're all so cute - is it obsessive to change your desktop weekly??? We are BOOKED BABY! Heading back to Orlando, FL in May. We have been wanting to go back since, well, since we got back from our 2005 Orlando vacation, lol. 2005 was our first trip to Disney with the kids (they were 4 & 6 at the time) and we had a total blast. I'll never forget walking into MGM Studios theme park and there were Mickey and Goofy. RIGHT THERE. NO LINES. Rod wanted to walk by and "come back later"...Ummm...are you NUTS??? It's MICKEY MOUSE! If you've ever been, you know that Mickey *always* has a long line and a big crowd around him! We went in January that year, and if you are looking for a time to go when the crowds are at a minimum, PICK JANUARY. They were in a bit of cold snap the week we were there, but usually it's warm enough for at least capri pants and t-shirts. We had almost zero wait times at all the parks and attractions, got to meet a TON of characters (I could literally fill up about 10 pages like this, lol) and had a FAB time. 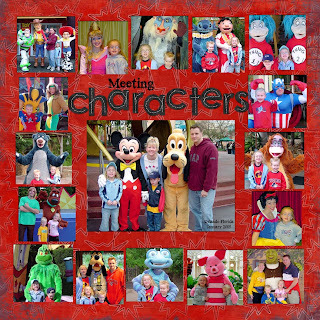 I'm hoping to get my 2005 Disney album completed before our Disney 2008 Vacation - what a fun way to build excitement for our upcoming trip! Page Credits: Quick Fill #36 from Heather Ann Designs, Paper from Kablamo kit (Shawna Klingerman) from Sweet Shoppe Designs, Hand Stitched Alpha from Dani Mogstad, Times New Yorker font. 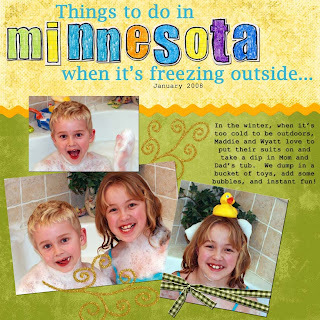 I originally picked up a couple of Heather Ann's Quick Fill Bundles for the QUANTITY of photos you can include on a page. I was thinking DISNEY pics, baby! I have a gazillion pics from our trip to Disney World in 2005 and would love to get them scrapped and into a book for us to enjoy! If you get a chance - head over to Heather Ann's idea gallery to see all the samples...(bring your wallet though, you will want these Quick Fill Bundles!) Now that I've played with them a bit, I know I these will be a staple in my scrappin' for everyday pages with just a couple photos too. Can't wait to get workin' on my Disney album! Page Credits: Quick Fill Template 37 from Heather Ann Designs, Olivia kit from Shabby Princess, Times New Yorker, and The King and Queen fonts. We interrupt this winter to remember sunnier, warmer weather! This is a fave photo of mine. Every spring, and every fall, I drag the children to Lake Rebecca Park for a photo shoot. Last summer, I upgraded to a digital SLR camera (Canon 30D), and I am slowly learning to use it. I started off shooting in auto mode (letting the camera make the settings choices for me) while I get used to the weight of it, and swapping out lenses and etc. I have a *lot* to learn! "Angela In Progress" I always say - lots to absorb and learn. Anywhoooo...On these portrait shoot outings, I always try to get a more formal pose of each, along with both a formal and informal portrait of them together. I have this print framed (5x7) along with the 8x10 of each of them - and then I swap these out each spring and fall, that way I always have current portraits on display. DH will tell you that I am a "frame-a-holic", lol. I just love putting little snapshots into frames - photography just makes me HAPPY! I will share more, as I learn - I am *determined* to get my camera off the "auto mode" and start managing my settings and lighting myself. On Friday I treated myself to a couple of photography books that I am browsing, and I plan to share what I learn here. Just remember: It's "Angela In Progress", lol, so if you are looking for perfection, it might be awhile! Page Credits: Paper from Shabby Princess Silly Boy Cuddlebug kit, Overlay by Traci Murphy from Blossom & Shine (DSD Freebie Collab) kit, Flower from ShabbyMissJenn Fondest Memories kit, Old Typewriter font. Lately, I've been feeling a bit overwhelmed with everything, and just crabby! This week was particularly icky - nothing specific, I think it's just this time of year, winter feels long, and when you top it off with things in general not going the way you plan...well then, the crabbies seem to set in! I had been too busy this week to really do any scrappin', so I decided that I needed to *make a point* to scrap today, to try to lift my blah mood. Since I'm pretty new to digi scrappin', my process probably isn't as organized as I could be, but I fumble around, and learn as I go, and just enjoy it. Sometimes, I start out with a specific kit or elements in mind that I want to use, and then search for pictures that I think will coordinate well. TODAY - (prolly because of my mood...) I started out with these pictures in mind to scrap, and THEN found the *perfect* kit and supplies to fit the mood of the photos. 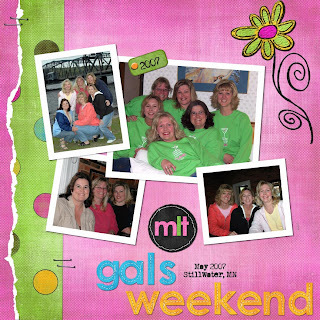 These pictures are from a "girls weekend". These are friends that I have had FOR.EVER. The "MLT Gals" we call ourselves, because we all met when we were coworkers at MLT Vacations. ANYWAY...none of us works there currently, but we have kept in touch, despite busy lives with husbands, jobs, and kids. We have what we call a "mandatory meeting" twice a year, and we all really look forward to these getaways. For our spring "meeting" we usually go somewhere, stay in a hotel, and see the sights, and in the fall, we shack up at someone's home. YUP. We boot out the hubbies and kids and it's JUST US GIRLS. We laugh, eat, drink, laugh, watch movies, laugh, play games, dance, eat, laugh, and recall the "good ol' days". It is always a fun and fab weekend, and we come home refreshed and ready to face our "real lives" again, reenergized. Page Credits: Template from Heather Ann Designs, Funky Chic kit from Shabby Miss Jenn, Hand Stitched Alphabet from design by Dani (Dani Mogstad), Old Typwriter Font. Well I *STILL* like to shop, I'm *STILL* a girly girl, and go Ga-Ga over the purses, shoes, belts, jewelry, and on and on and on, lol. Shopping sure has changed for me - I live close to dozens of shops and malls, so I don't have to plan my trip a week in advance. With Digi Scrappin' - you don't even have to leave your house! Do you Kaboodle? I recently joined, and let me tell ya - this is a FAB WAY to keep all of those digi kits you WANT organized when you are browsing the different digi shoppes. If you are like me, you have a TON of favorite shoppes/designers to visit (just see the blinkies on the right side of this blog for some of my faves). Whenever I see a kit, elements, or brushes and actions that I covet and lust after, I just clickety click on my "Add to Kaboodle" button from the toolbar (install the toolbar - you NEED the toolbar) and it adds it to my list, and then takes me back to the page I was browsing. SLICKETY SLICK! Fabbity FAB! 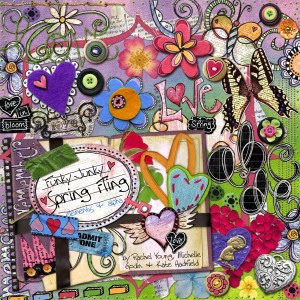 And here is the latest kit I just added to my Kaboodle - I am going to TREAT MYSELF to this (Funky Junky Spring Fling) today, after I finish my Saturday chores and errands! See the darling QP Album? I think I *need* that too! Have a FAB SATURDAY - Shoppin', errands, chores - whatever you are doin' today! 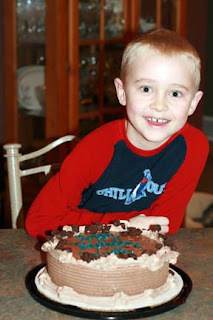 Well I just can't believe that my BABY is EIGHT! How can it be??? 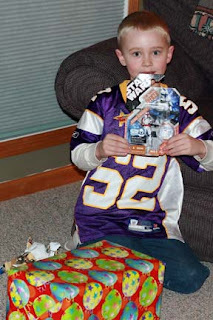 Where does the time go??? 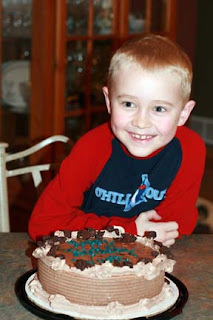 We celebrated with a trip to Red Lobster - the birthday boy's pick - then came home for presents, and a yummy ice cream cake from DQ. 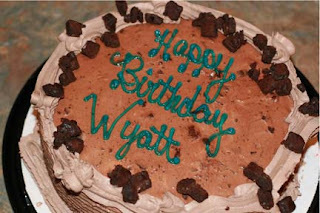 Can you say Death by Chocolate? Or maybe Death to Diet is more accurate...lol! I can't wait to scrap these pictures! Will you be my Digi-tine? PHEW! Last week was HECTIC to say the least! Rod's Grandma passed away on Wednesday, so we had to quickly make arrangements for the trip to Ottumwa, IA for funeral services. It was a five hour trip each way for us, but well worth it to say our goodbyes to a great lady! It ended up being a fast trip, too, as we had to turn right around and head back, since they were expecting a blizzard overnight last night! I did want to share these Valentine's I made for the children to pass out to classmates. This was my first digi "hybrid" project! Yea for me! The treat bag toppers were entirely digital, using the darling Wild Thang kit by Dani Mogstad and Lauren Grier. SO CUTE! I love all the papers and elements in this kit! They also had Valentine's using this kit that I picked up as well. The little candies are actually Hershey Nuggets covered with stamped Avery labels. Nicole Heady (PaperTrey Ink) has some really cute sets for personalizing these for any occasion. Lots of fun to stamp these! I've had this page "in progress" for about a week, and today seems the perfect day to finish it up, since we are having *another* one of those ULTRA COLD (you know, the kind we brag about here on the ol' GLACIER, lol) subzero days! Today, we woke up to -15F temps, and -38F windchills. Ummm...BRRRRRR! I keep folders organizing all of my layouts, and my "In Progress" folder has really saved my sanity! For instance, for this LO, I was determined to find the perfect frames for these photos, but I just couldn't get my fingers (or my mouse, lol) on what I was "seeing" in my head, so I finally filed this layout into the "In Progress" folder, and moved to a different project. When I came back to it today, I realized, I didn't need frames at all, and was able to finish up this layout with a "fresh" perspective. In addition to "In Progress", I also keep a folder for "Full Layered Files", "Print", and "Web". "Print" and "Web" layouts are saved as .jpg files, with different sizing specifications, and the "Full Layered Files" includes the .psd file format, with the layers intact. This allows for me to go back to the layered file, and make any changes if need be. Case and point: for this layout, I actually noticed a TYPO (the HORROR!) after I had already flattened the image for print and web. Since I still had the full layered file, I was able to fix the typo w/out starting all over. PHEW! CRISIS AVERTED! Page Credits: Papers and Elements from Sugar Cookie Kit (Melissa Bennett), Alphabet from The Happy Alphabet (set 1) from Marcie Reckinger. Just a quick post today...I have been wanting to scrap this picture of the dog. Her sweet little face just says it all! She gave us QUITE A SCARE a little over a week ago. She was violently sick during the night, so sick that I was afraid for her. I really can't imagine life without her, as she is our first "baby". We managed to get a vet appointment for the next day, and found out that she was suffering from Pancreatitis, which can be very serious. So it's been a special rice diet since then, and she was really hurting for the first few days, and was quite the "Mama's Girl". She just had her follow up appointment, and I'm so relieved that her enzyme levels are all completely back to normal. YEA! I finally feel like I can breathe a bit easier! Here is a desktop freebie from the Girl Talk Blog! For mine, I'm using a snapshot from this past summer, when we visited Rod's Grandma. Grandma is 97, and her health is beginning to fail. I hope she will be with us for awhile yet! Do you change out your desktop? I have gotten into the habit of switching to a new one each month. 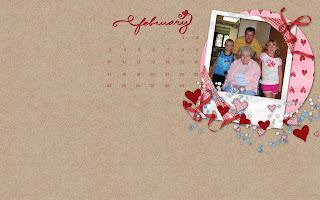 Shabby Princess also does a new desktop each month, if you want to check hers out. I really like how each of these leaves room on the left for my program icons, and LOVE the calendar for the month! I think for March, I will attempt to design my own! I have been a not-so-fab blogger! YIKES! It's been a crazy couple of months! Starting around late November, I started having computer problems, and they just continued to escalate. LOTS OF LOST HOURS of productivity! I won't bore you with all the details, I'll just skip on over to the good part, which is: My new computer is officially up and running! WHOOHOO! Effective last night, I have moved ALL of my digi kits over to my new machine (with the exception of one stubborn kit, lol) and I am itchin' to get scrappin'! I still have to move my photos over too, so no scrappin' yet, as I ran out of steam last night at 11:45pm. 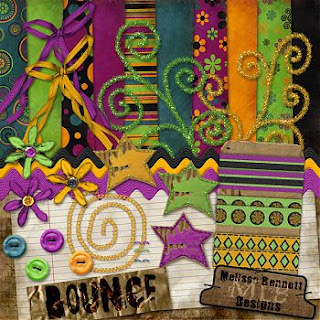 I consoled myself by heading over to Scrapbook-Bytes and making a few purchases from Melissa Bennett's shop. DON'T YOU JUST LOVE all of her kits??? How fun are these kits? My fab new blog banner is using Love N' Junk. 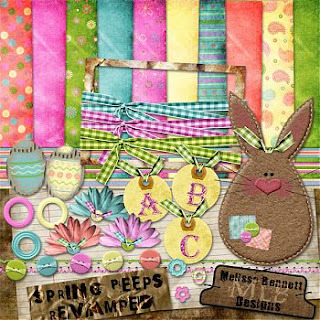 I can *hardly* wait to make one using that darling li'l bunny from the Spring Peeps Revamped kit.